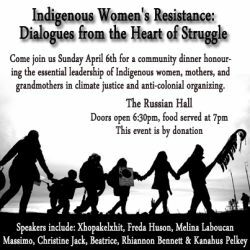 Come join us Sunday April 6th for a community dinner honouring the essential leadership of Indigenous women, mothers, grandmothers and daughters in climate justice and anti-colonial organizing. We will be hearing from some incredible Indigenous women who have been integral in connecting the fight against violence and exploitation of the land and the struggle against systemic violence targeting Indigenous women. “Most indigenous women understand that our struggle as women is integrally related to the struggle of our nations for control of our land, resources, and destinies.” -Winona LaDuke, Anishinaabekwe community organizer. Doors will open at 6:30pm and food will be served at 7pm. Families are welcome and free childcare will be provided. Xhopakelxhit (of ANCESTRAL PRIDE): Daughter of T’teyun, head of the house of Thunder and Lightening from the Musqueam xumulx. Wife to Gwaiina of the house of Seicthumalthnee, from the Ahousaht Ku us. NYM og's, West Coast warriors seeking to create a culture of resistance by: asserting the jurisdiction and authority we have over our lives and lands. We are in resistance to colonization, industrial land death, mining, logging, pipelines and the illegally occupying military force of so called canada. We also are part of a larger network of decolonizing sovereign nations. Freda Huson: spokesperson of the Unist'ot'en clan of the Wet'suwet'en. The Unis'tot'en are taking action to protect their lands from Lions Gate Metals at Tacetsohlhen Bin Yintah, and have also built a cabin and resistance camp in the pathways of approximately seven proposed oil and fracked gas pipelines. Melina Laboucan Massimo: Melina Laboucan-Massimo is Lubicon Cree from Northern Alberta. She has been working as an advocate for Indigenous rights for over a decade. She has worked with organizations like Redwire Native Media Society and Indigenous Media Arts Society, and is currently completing her Master's in Indigenous Governance. Christine Jack: Lives on the Bridge River Reserve in the ST'AT'IMC, Territory, a hunter, fisherwoman, gatherer of traditional foods, and serves as a spiritual worker, sweat-lodge keeper as well. Christine is 46 years old and has two adult children, standing strong for the future! Beatrice: B. has lived in Vancouver for 35 years. She is from Bella Bella. She is currently 29 years sober and volunteers at the Downtown Eastside Womens’ Centre. She loves being part of the DTES Power of Women Group because the group fights for everything she has been through – from violence and abuse to child apprehension – and gives her a voice! She also marches in the February 14th Womens’ Memorial March Committee for her murdered sister and niece. Rhiannon Bennett: A Musqueam woman who stood up with her community to stop condo development on a traditional Musqueam Burial Site, and won. Kanahus Pelkey: Native Youth Movement Mother and Warrior from the Secwpemc nation. Over the past several decades, Kanahus has been active against - and been arrested - in fighting Sun Peaks Resort, Imperial Metals, 2010 Olympics, and a number of development projects. She has worked with many Indigenous Nations throughout Turtle Island with a clear mission to defend territory and protect clean water, food, and land. The venue is wheelchair accessible, and we are renting a wheel chair accessible washroom as well (as theirs is located down a set of stairs).